Hand made sets of (7) please msg the set you would like ..(fairys)..(elephants).. (Hands).or. (hearts) or ..(beads)..great for crochet or knitting ..and button markers ..would make great gifts ..comes in little gift bag .with pull ribbon .. These are very fine so suitable for all yarns from 2 ply to chunky. 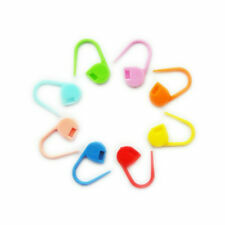 KnitPro Locking Plastic Stitch Markers. Have lobster clap so are suitable for a variety of uses, stitch markers, row counters, crafts, accessories, charms etc. A lovely set of ten Stitch Markers. KnitPro Locking Stitch Markers. Locking Stitch Markers from KnitPro. (15 of both Purple & Green). Other Information. A set of five lovely stitch markers, LADY BIRDS. 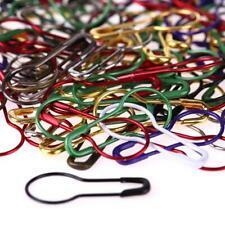 Knitting Accessories - Row Counters, Locking Stitch Markers, Point Protectors. A set of 8 stitch markers CATS. Designed for knitting or crochet stitch to prevent from sliding off. Material: Plastic. Great for marking the beginning and end of pattern stitches, as well as where to increase or decrease the number of stitches. These are a lovely set of ten stitch markers in the shape of skeins of yarn. 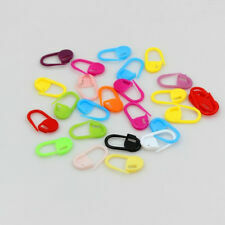 Have lobster clasp so are very useful for a variety of things, stitch markers, marking the end of rows, charms, accessories etc..
KnitPro Ring Stitch Markers. Hard Plastic. A set of 10 stitch markers. A set of 5 stitch markers CATS t.
For use with circular, double pointed or straight needles up to size 6.5 mm. These are two plastic row counters small and large, in blue and red. Material: iron, copper. Due to the different monitor and light effect, the actual color of the item might be slightly different from the color which is showed on the pictures. If item is defective after 3 months, you can still send it back to us. Ten lovely stitch markers SWANS. Included: 1 Box(104pcs) X Knitting Crochet. 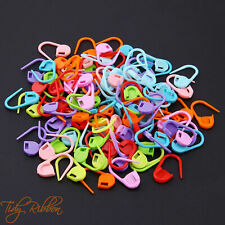 Usage: Knitting accessories tools, crochet locking stitch plastic markers. Color: Red, light blue, lake blue, light rose red, yellow, navy green, purple, orange. 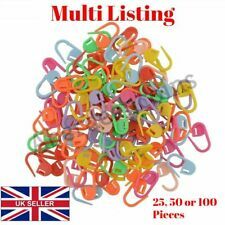 100 x Plastic Locking Needle Stitch Holders Markers For Crochet/Knitting. Condition is New. Dispatched with Royal Mail 2nd Class Large Letter.